In order to execute your best performance in endurance sports, you need to utilize every possible small gain, which is why you should dedicate a short amount of time before each workout to foam rolling. Just like coaches who target workouts that stimulate specific responses, it's wise to only use foam rollers in specific ways, rather than rolling randomly and haphazardly — and potentially creating problems for yourself. This post shows you proper foam rolling techniques for endurance athletes, with detailed information and diagrams. Rolling does cause dull pain on certain muscles and ligaments, but it shouldn't be excruciating. If you experience intense pain, immediately stop and have it checked out by a physician. Above all, don't let unnecessary fear keep you from maximizing the benefits of foam rolling. We have connective tissue beneath our skin called "fascia" that separates our muscles, in addition to keeping them attached and stabilized. When fascia is healthy, it's limber and moves smoothly. Unfortunately, the repetitive motions of endurance sports cause fascia to get bunched up, which keeps you from preforming optimally. The solution is to do some simple foam rolls, which you can execute by yourself in under 10 minutes. Keep things simple and focused. Concentrate on a few specific areas, and get yourself in the habit of rolling before every workout. There are advanced foam rollers with ridges and electronics, but the inexpensive Basic High Density Roller option from Amazon works well and is a good place to start. If you travel a lot, there are smaller rollers available that have hollow cores that are easy to pack, such as the TriggerPoint Grid Foam Roller. Yoga mats can also be helpful. They keep the roller from slipping when you're applying pressure at odd angles, and they make floors more comfortable. But don't let the absence of a yoga mat keep you from rolling. Focus on improving your performance and get on the floor. Only use your bodyweight to apply pressure. Work on each targeted area for 30 to 60 seconds. If you feel any tightness or sensitive areas, pause and relax on this spot for 5 to 30 seconds. Don't rush your rolls. Always move slowly and gently. Your tensor fasciae latae (TFL) is a short muscle at the top of your thighs. It's connected to your iliotibial tract (IT band) and works in concert with the gluteus maximus when running. Rolling your IT bands can cause damage in some situations, but rolling your TFLs is beneficial and can alleviate issues with your IT bands without interfering with them. Your glutes are a big part of the engine that powers your runs and rides. Like the TFL, glute muscles are connected to IT bands. Working your glutes with a roller can benefit your IT bands without interfering with them. While not completely necessary, crossing your legs when foam rolling your calves adds a healthy amount of pressure. The hamstring position is very similar to what you do for the calves, and because these muscles are on the back of your legs, crossing your legs adds helpful pressure. As long as you use it carefully, a foam roller can be seriously helpful. They can even be used to roll after a day of traveling or when you’ve been sitting at a desk for long periods of time. Be mindful not to roll bones, and don’t blindly roll an injury without advice from a doctor or an experienced coach. 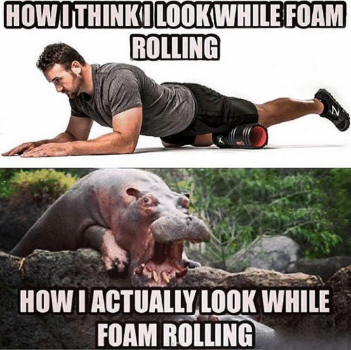 IMHO the foam rollers (or even harder ones) work well on the glutes and hams. I find a spiky laundry ball best to sort out the calves. Interestingly rolling out Hams by your method can also sort out lower back pain. Thanks for the tips, 5KR!